How To Enjoy FAN N STAR! What is Star Points of FAN N STAR? 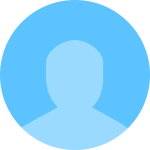 1) Click profile after logging in. 2) Click Daily Stars from the Menu. 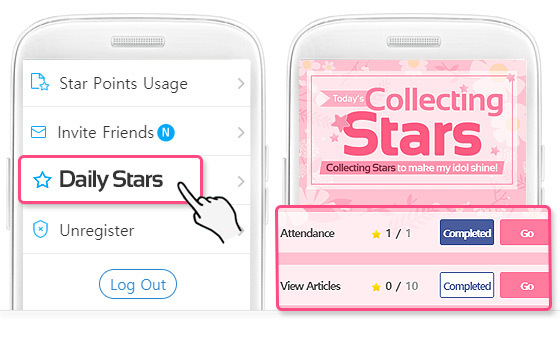 3) Collect Stars through daily star missions. 1) Click Vote for the desired candidate. 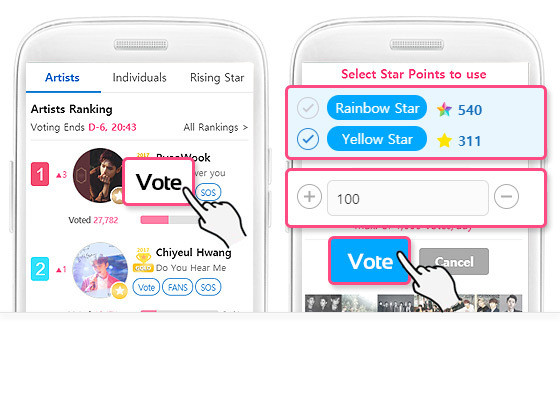 2) Choose the Star to vote, enter number if how many, and click Vote to complete! I Care for My Idol Star! FAN N STAR hosts various idols' birthday fan support markets every week. At least 100% achievement is needed for the support to proceed. 2) Click Daily Star from the Menu. 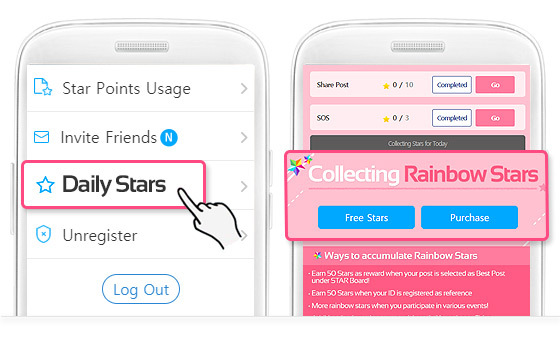 3) Rainbow Stars can be earned via Free Charging, Watching Ads, and Purchasing. 1) Click the Menu on the upper left. 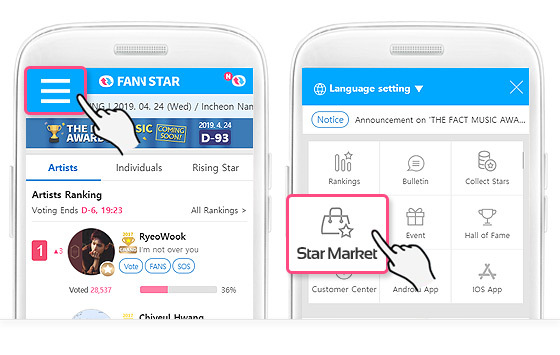 2) Click Star Market Button. 3) Click the desired singer’s event and click Participate! 4) Enter number of Rainbow Stars, and click OK to complete! * Re-Participation after cancellation is not possible. If you clicked cancel by mistake, kindly send an inquiry through the Customer Center. Fans Supporting Stars are Beautiful! 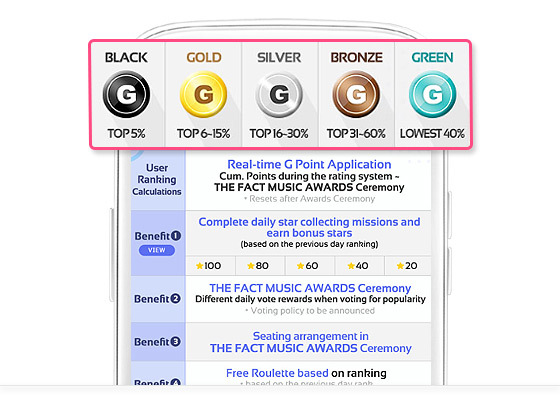 Point System to Support Fans, the G Point! 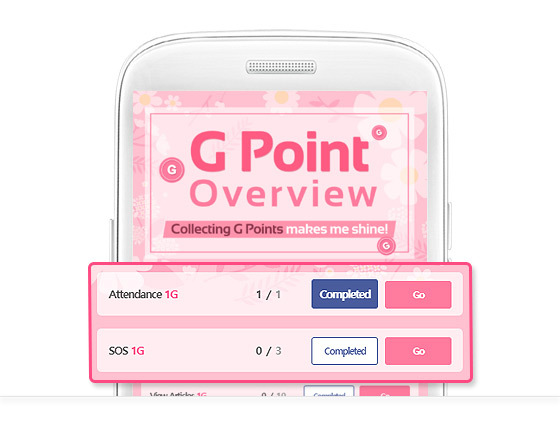 G Points can also be collected through missions like Star point collections.